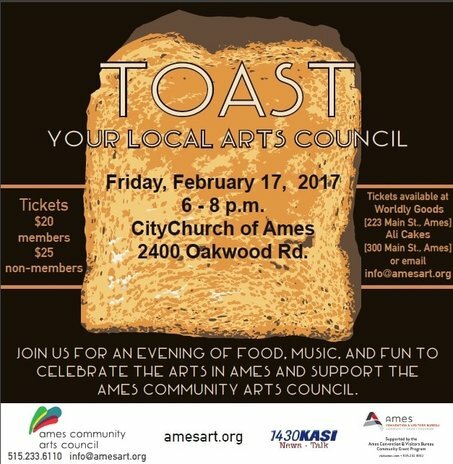 The Ames Community Arts Council will host its biennial fundraiser, "Toast Your Local Arts Council" on February 17, 2017 from 6 – 8 p.m. at the CityChurch of Ames [2400 Oakwood Rd.]. Tickets are $20 for Arts Council members, and $25 for non-members and are available at Worldly Goods (223 Main Street) and Ali Cakes (300 Main St.), both in downtown Ames. If you'd prefer to pay via credit card, you may email us at info@amesart.org, and we can invoice you and mail your tickets. There will also be tickets available at the door. But, if you buy in advance, you can help us to be sure we have enough food and drink for everyone! It's going to be a great evening for all ages. Arts Council member Paul Hertz has agreed to DJ for us, and he'll be playing music written and performed by Iowa musicians - he has quite the collection. some amazing food, best described as "heavy hors d'oeuvres" and some toast-themed items that are sure to be delicious and that we hope make you smile! fantastic drinks, from coffee and hot chocolate to wine creations. We're excited to have Sharon Stewart of the Lockwood Cafe as our barista - she is sure to come up with some tasty, creative things for us. a few craft/writing activities to keep you entertained while you mingle, because we're artists, and everything is better with crafts and writing. and, of course, we'll be highlighting our members throughout the evening and talking about the wonderful things that the Arts Council does and is hoping to do in the coming year. ​The Ames Community Arts Council is a 501(c)(3) non-profit organization funded through memberships, donations, and grants. If you would like more information, please contact us by calling 515-233-6110, or e-mailing info@amesart.org. We hope to see you there!